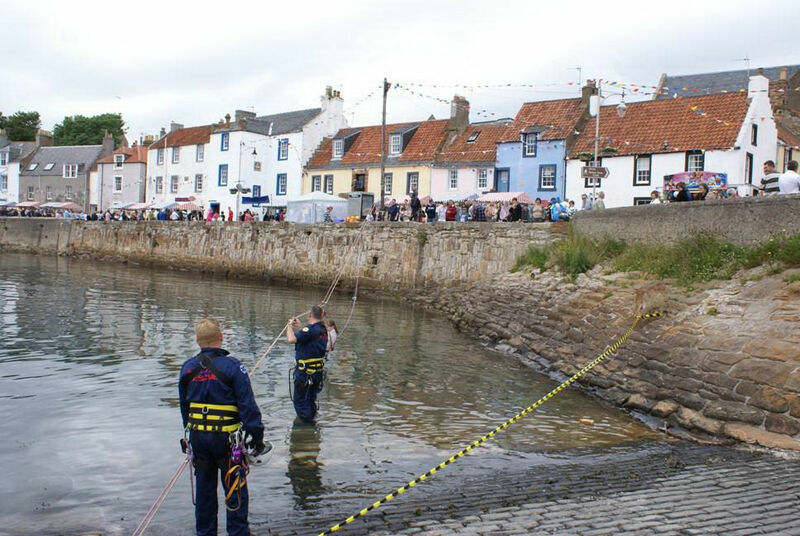 St Monans Sea Queen Day is a traditional East Neuk Gala Day dating back to the 1950s when St Monans was a busy fishing village. Nowadays the event is a fun-filled family day which takes place in, and around, the picturesque old harbour. The Sea Queen, arrives with her Royal Party aboard the Reaper, a 100 year old fishing boat, and attended by the Anstruther Life Boat. She then proceeds along the street accompanied by a pipe band to the Crowning Ceremony. The day includes children's rides, displays, charity stalls, children's fancy dress competition, judging of the primary school's art competition, model boats, a raffle, crafts, mini street market, food stalls and live music. John Kinsman member of the High Access Rescue Team invited the rest of the team (Again) to take part in his local village Gala Day.